Fabrar Liberia is a rice processing and marketing company located in the heart of Liberia’s rice growing belt whose principal mission is to improve farming livelihoods by helping Liberian farmers gain access to previously unreachable national and international food markets. Fabrar therefore uses a commercial arm that adds value to, and creates a market for, Liberia’s agricultural products, while its social arm builds the capacity of its smallholder farmers and provides gainful market access that allows them to grow their farms and businesses sustainably. Through these activities, Fabrar is building a solid consumer demand for high quality domestically produced rice while also raising farm incomes and positively impacting the socio-economic wellbeing of the people it works with. Our vision is to create a virtuous cycle where prosperous Liberian food producers and smallholder farmers are able to profit from their labor while providing customers a quality and nutritious grain they are happy to buy. Fabrar offers its Red Rice to niche markets in Liberia as well as internationally. For these premium markets, Fabrar provides bulk shipments from Monrovia to destination. A variety of packaging options are available (500g-10kg), while custom packaging/branding can also be arranged for buyers according to their own specifications. 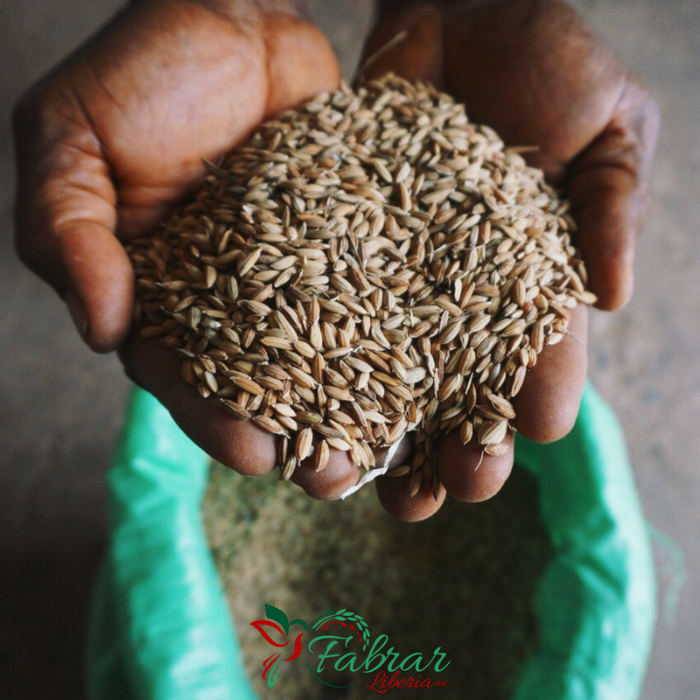 In addition to its remarkable Ruby and Red Rice, Fabrar also processes a variety of other white grained rice through which the company creates an even wider market for Liberian Farmers. The White Rice the company processes has tremendous potential for import substitution and job creation within Liberia through volume sales. Fabrar offers its White Rice as an affordable and high quality option for the local staple. Fabrar also offers products and training to farmers in post-harvest techniques that help to make their rice more commercially viable. Focusing on the key areas of parboiling, drying, and the safe storage of paddy, Fabrar’s services are available to assist farmers in guaranteeing a willing market for their produce. In 1962, Julius Cooper, a young agricultural economist, began working to improve the production of Liberian Red Country Rice, a super grain that is rich in antioxidants, vitamins and minerals. Fabrar Liberia, Inc. was founded in 2009 by Julius Cooper’s children and grandchildren to continue his legacy of creating value for Liberian rice. Fabrar is a Liberian-owned agribusiness holding company with the social purpose of increasing the access of Liberian farmers to local and international markets. The Fabrar team is comprised of a carefully curated group of passionate professionals who possess decades of combined experience from diverse backgrounds. It is due to the collective efforts of our team and management that we are Liberia’s top rice manufacturer. Each employee is dedicated to carrying out our mission and vision and making a positive contribution every day. That’s what makes Fabrar work. Jeanine Cooper is Founder and Senior Managing Partner of Fabrar Liberia Inc. She began her career owning an agribusiness in the rubber sector. She subsequently worked for 26 years as an international civil servant, including 13 years with the United Nations in various postings across Africa. Fabrar Liberia Incorporated is the realization of a lifelong dream to create value for Liberian rice and other local food products. Fabio Lavelanet is a business school graduate who has honed his academic skills by implementing the design for starting up Fabrar Liberia Inc. He has guided the enterprise from its inception to the present status and was responsible for all aspects of the start-up including business registration, initial procurement of assets, establishing the milling operation, recruiting staff and installing the business flow model. All current operations are his responsibility and the full experience of eight years of company operations are primarily attributed to his tenacity, his skilled problem-resolution and endeavor. Whykies Mentee has operated agri-businesses for some 27 years primarily in Margibi County. He has also worked for two years with the NGO Médecins Sans Frontières-Belgium, managing their warehousing and procurement in Ganta, Nimba County. He has successfully and simultaneously managed up to 4 rubber plantations at a time, ensuring rubber production and sales, personnel management, procurement of inputs, etc. He has also been a commercial rice farmer for a number of years. From its establishment, he has overseen the entire operation of Fabrar Liberia while also ensuring the initial production of rice on Fabrar managed farm holdings. Samuel G. Mentee has over three decades of experience managing farm production systems in Liberia. Mr. Mentee worked for several years with various NGOs such as Catholic Relief Services; managing their seed banks and farm production services and organizing seed fairs. A seasoned agricultural technician, he has a wealth of experience in agricultural project management and NGO management as well as in project development, monitoring and implementation and farming in Liberia. Francis B. Cooper has more than 21 years of experience as a logistics and technical manager for the NGO Médecins Sans Frontières-Belgium in Liberia and in various disaster-prone countries (Cote d’Ivoire, Sudan, DRC, Pakistan, Indonesia, etc). He has coordinated, started and managed operations in sizeable MSF missions under the most challenging of circumstances. He has been a member of Fabrar's board since 2011. Vannette Tolbert is a Marketing & Branding Strategist. who has worked with global brands including Orange Liberia, Virgin Hotels, Ferrari, The Tourism Authority of Thailand and many more to achieve their marketing, branding and advertising goals. Vannette studied Mass Communications in undergrad and went on to receive a post graduate certificate in Marketing Strategy and Branding from New York University. After working in the marketing and advertising industries for over a decade, Vannette joined the Fabrar Liberia team, as communications manager; coordinating and executing the company’s marketing and branding efforts. While Fabrar uses our commercial arm to add value to and create a market for Liberia’s agricultural products; our social arm builds the capacity of our smallholder farmers and provides gainful market access that allows them to grow their farms and businesses sustainably. Through these activities, Fabrar is building a solid consumer demand for high quality domestically produced rice while also raising farm incomes and positively impacting the socio-economic wellbeing of the people with whom we work.